That’s right, we are off to New York. 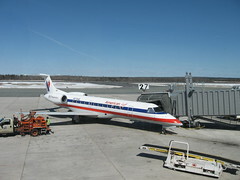 This is our little 39 seater American Eagle aeroplane bound for La Guardia airport. As you can see the weather has improved 100% and it was a beautiful day for flying. The trip was two hours and whilst a little bumpy it did end with a fly over Manhattan Island which gaves us a good view of the major landmarks. You do remember that he was persona non grata to the Australian Union movement after making some unpleasant comments about a lady journalist. I suppose some others sung that song but …..
Iknow, I know, (for those who want to know the full story hire ‘The night we called it a day’, Dennis Hopper plays Frank Sinatra). Any suggestions for a new title? Two more PC suggestions ? ?